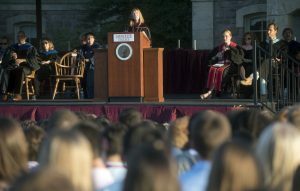 President Alison Byerly spoke to the Class of 2020 during Convocation ceremonies Aug. 28. Convocation is the final part of new student orientation. On behalf of the trustees and faculty, I declare that the Class of 2020, Lafayette’s 185th class, is now matriculated. We welcome you into Lafayette College. Before you sit: Continuing a tradition I began two years ago, I’d like to take a picture of the terrific view from up here, which I’ll send out later on Twitter. You may be seated. It is a great pleasure to gather together as a community on this lovely evening to welcome the Class of 2020. 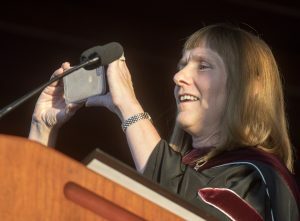 President Alison Byerly takes a photo of the new class to post on Twitter. I would like to begin my remarks by acknowledging some of the many people who make tonight’s ceremony possible. These include: Dean of Advising and Co-Curricular Programs Erica D’Agostino; Dean of Students Paul McLoughlin; Director of Student Involvement Kristin Cothran; Project Director Billie Weiss; Provost Abu Rizvi; Faculty Mace Bearer/ Professor Ilan Peleg; Dean of Admissions Matt Hyde; Student Government President L’Eunice Faust; Dean of the Faculty Robin Rinehart; College Archivist Diane Shaw; Alumni Association Executive Director Rachel Moeller; Professor Jennifer Kelly and the Lafayette Concert Choir; Chaplain Alexandra Hendrickson; and the Facilities Operations staff who worked hard all week to set up this platform and chairs. Please join me in thanking all of these colleagues. I’d also like to offer a special thanks to orientation directors, Emma Fortier and Cory Pressl, Welcome Week co-directors Lillie Johnson and Grace Veghte, and the Orientation Leaders who, with the help of RA’s and Pardners, have worked so hard to make these last few days a great introduction to Lafayette for you. We also have another, very sad, acknowledgment to make. As I think you all know, we lost a valued member of our community when Sarah Bramley ’19 died just over a week ago. Sarah was a vibrant and dynamic presence on this campus, and will be greatly missed by all who knew her. Yesterday, a number of students, faculty, and staff traveled to New Jersey to attend Sarah’s memorial service. In his remarks at the service, Sarah’s father began by noting how much Sarah loved Lafayette College, and how she felt at home here. Mr. and Mrs. Bramley also told me afterwards how greatly they appreciated the support they have gotten from the Lafayette community. Several of Sarah’s friends, too, have said how much they value the strong sense of community at Lafayette during this difficult time in particular. I hope that continually working to sustain and strengthen those bonds will be an appropriate way to honor Sarah’s legacy. Please join me in a moment of silence as we remember Sarah. You take your place today as part of a special community, one that is more than 180 years old. I’d like to talk for a few minutes about the role of traditions in strengthening community, and the important role of community in your education here at Lafayette. You have already seen today one dimension of the college’s traditions: the prominence of the figure of the Marquis de Lafayette as a guiding symbol for the college. When you first learned about Lafayette College, you may have wondered how the College got its name. At the time of the College’s founding, Lafayette was one of the most famous and revered names in America. Lafayette’s dedication and heroism in traveling from France as a young man to support the American revolution, as well as his status as a close friend of General Washington, had made him a legendary figure. In 1824, he returned to America as a beloved elder statesman and was greeted with extraordinary adulation as he toured every state in the union. Over the years, this self-chosen identity for the college has been reinforced through the adoption of statements, mottos, and values associated with the Marquis de Lafayette, including quotations from his writings that you find in many college documents, the various portraits and statues that enrich the campus, and many student poems, songs, and even videos inspired by the Marquis over the years. As you have already seen, we honor Lafayette’s legacy in many of our college traditions. Over this last year, it has of course been fun to see how the figure of Lafayette has achieved renewed national prominence as a result of the musical Hamilton. The Marquis de Lafayette as played by Daveed Diggs has energy, ambition, and swagger. He introduces himself with the lines, “Oui, oui mon ami, je m’appelle Lafayette, the Lancelot of the revolutionary set,” and he lives up to that billing. Like the Alexander Hamilton portrayed by Lin-Manuel Miranda, Lafayette is an immigrant who has adopted American values and made them his own. As entering students, you play an important role in maintaining this historic legacy through your membership in the residential commons to which you belong, each of which bears the names of five ships on which Lafayette traveled to and from America. These Commons will provide the foundation for your first-year communities, and will help to launch you on your Lafayette journey. Please stand and be recognized when your Commons is named. You are allowed to cheer for your own commons! Not all of the College’s traditions derive from our connection with Lafayette. Many are associated with our historic rivalry with Lehigh. Of course, some of the pranks and traditions associated with the rivalry in past years– such as bonfires, vandalism, kidnappings, and the tearing down of goalposts—have changed with the times, and you are no longer expected to wear jackets and ties, or dresses and corsages, to the Lafayette-Lehigh game. But there are still many songs, jokes, and traditions associated with the rivalry that continue, and what has not changed is the way in which the rivalry provides a unique focus for displays of school spirit that very few colleges like Lafayette can muster. In 1935, a list of informal rules and traditions for incoming freshmen noted that “the oldest and most beautiful of Lafayette traditions” is that of gathering in front of Pardee to sing the “Alma Mater” and other college songs. When we close tonight’s ceremony by singing the “Alma Mater,” you can picture to yourself the many generations of students going back more than a century who have done the exact same thing. These kinds of traditions help bind the community together, both within each successive class, and across generations of alumni. And Lafayette’s powerful sense of community is, I would argue, one of its greatest strengths, and an integral part of the education we offer here. Education, after all, is not simply a matter of solitary mastery of information or skills. It involves dialogue, questioning, testing, experimentation. This process of active engagement begins in the classroom, with dedicated and creative faculty who will challenge you with new areas of study and new ways of looking at topics you may have thought were familiar. It also involves a broader intellectual community that ideally radiates outward beyond a single course or assignment. You will find that your most powerful learning here often includes the extension of that classroom experience to discussions outside of class, with faculty and with other students in which you learn from your friends and they learn from you. It will also include the learning and growth that comes through leadership and participation in other areas, including athletics, artistic performance, community service, and other activities. Your education will be shaped by faculty mentors, advisors, and coaches, but also by the students around you, and their experience will be shaped and changed by your presence. In that sense, the diverse community of fellow students we have assembled here is a critical resource in your own education. I urge you to take advantage of that resource. As Dean Hyde noted, your class includes a wonderful variety of students from a range of geographic locations and backgrounds, who have a tremendous variety of talents and interests. Get to know them. It is a natural human tendency to gravitate towards people who are similar to ourselves, and technology has made it easier for all of us to find and listen to the voices with which we are most comfortable. But you will learn more, and be better prepared for the world you will enter when you leave here, if you look for opportunities to extend yourself beyond your comfort zone. More importantly, you will be in a better position to change that world, and make it a less polarized and divisive place, if you bring with you the habits of outreach and curiosity that we try to foster here. Your commons, and the orientation groups that you have been part of for the last few days, are a good launching point for that effort. As time goes on, your commons community will no doubt be supplemented by other friendships, but it can provide the initial scaffolding for a robust network of support. We hope that in the end you will view each group, team, club, or living group that you join here not as a single, exclusive circle of friends, but as one of a series of interlocking and overlapping circles — connected communities that form the powerful network that is Lafayette. Best of luck to all of you with the start of classes, and the start of your Lafayette journey. We are so pleased you have chosen to take that journey with us, and look forward to seeing all that you will accomplish, both as students and as alumni. Thank you. My best college friends were people who did things with me in club activities. Second to these close groups was the beginning group of about twenty people. Even now, more than 40 years later, I count this first group among my friends.